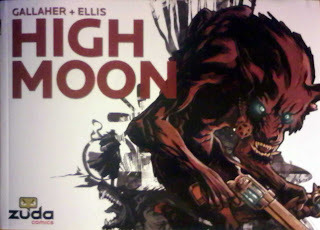 If I had to make a complaint against High Moon, it would be that it doesn't come out faster. I've been following the comic online since Day One, and I've sometimes run into problems where too much time elapses between my readings and I forget significant story points. That's certainly not a problem if you're just starting the series now, and need to catch up on 100-some odd pages, but the comic does require some concentration if you're in it for the story. I haven't done a formal review of the comic myself since last year, but I will say that Gallaher and Ellis don't drop the ball for a second throughout their entire run so far. Everything I said originally is just as valid now as it was then. Look: you can go read High Moon online for free if you want to see if you like the story. I think it's great, but Zuda is providing a no-cost way to try it out for yourself, so there's no reason not to take them up on it. If it turns out that you do like the story, they've got a copy in print that you can pick up now for $14.99. (Well, technically, you won't be able to pick it up until September 30 when it officially hits stores.) If you're concerned that a webcomic won't translate well into print, don't be; this book is one of the smoothest web-to-print transitions I've seen (along with Tozo) and it's well worth a look. I interviewed Steve at NYCC 08. He's a prolific artist. Eh for some reason my youtube video link dissapeared- disabled? You can't embed videos, but you should still be able to link to them. Try just posting the URLs.